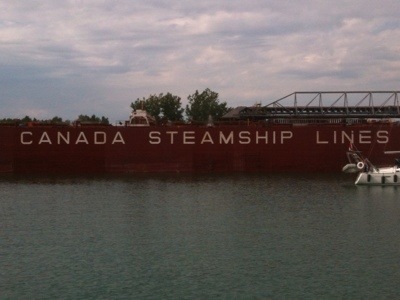 We are anchored just outside of Cornwall after going through the Snell and Eisenhower locks today. We left at around 9:30 (I wanted to go jogging before we left) and it is a good thing that we left late. All the keeners that were at the marina with us left at 7:00 and when we arrived at the first lock at around noon (and we stopped and went swimming for half an hour), they were anchored outside of the lock. A couple of freighters went by us and they take precedence over pleasure craft, so everyone else had to wait. When we stopped to go swimming, we had a great swim. The water was refreshing and the air temperature was hot (what else is new?). 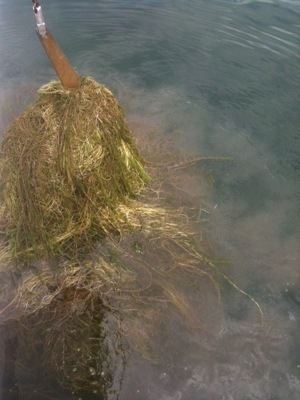 When we left though, there was the biggest pile of weeds on the anchor we had ever seen! Dennis took quite some time getting rid of that! Then, we noticed that the boat wasn’t working too well so he had to dive down on the propeller and get rid of the pile of weeds that had wound their way around the prop. Always something! 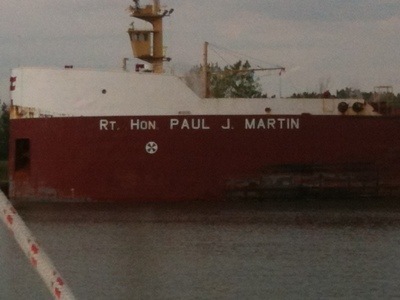 Anyway, we arrived at the lock just as a freighter passed us, so we knew that we would have to wait. There was quite a collection of boats waiting with us and when we got into the lock, we were rafted onto another sailboat. 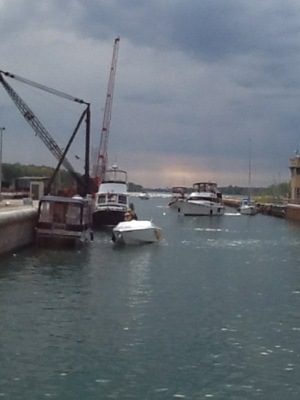 Then, another boat rafted onto us and then another boat rafted onto the them. 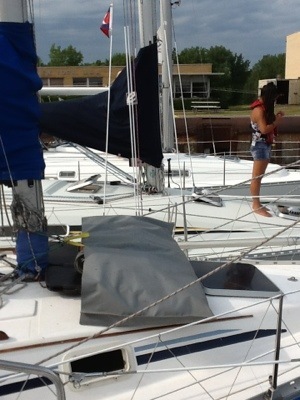 In all, we had four boats all tied together. In the lock, I counted 22 boats. Once we got into the next lock, we ended up being rafted with five other boats! It all went smoothly though and we went down another 40 feet without any trouble. Good thing that it wasn't windy out. By the time we finished with the locks though, we were tired so we just anchored outside of Cornwall and the cook is making one of his specialties – some sort of concoction with sausage, tomatoes and a few veggies. I’m sure Dad, that you remember those dishes from your trip a few years ago! Happy belated Anniversary to you two. It looks as though Denis still had to work that day with the photo of him handling that big rudder. food in some places but I wouldn’t trust it being that far downstream. I have become a junkie for your blogs. I look forward to reading about your adventures each day.